X-Ray? 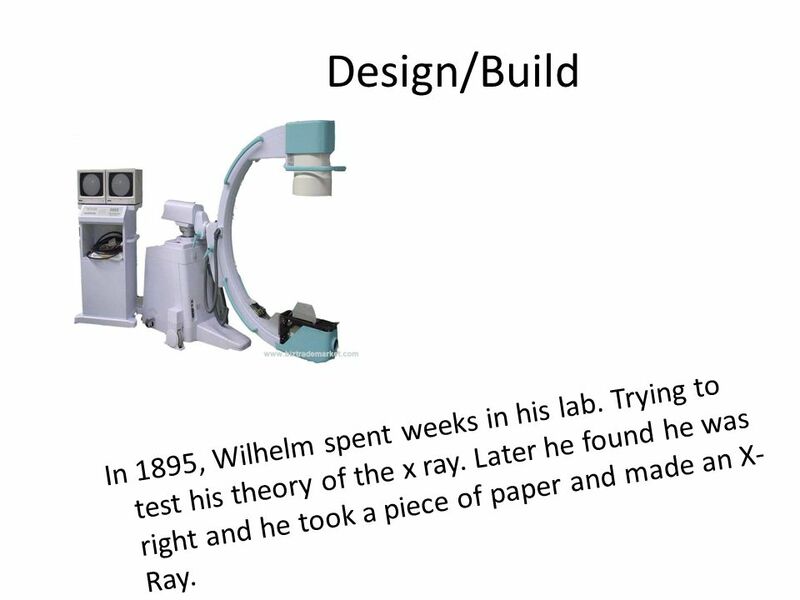 WilhelmWilhelm accidently discovered the X-Ray. There was no problem, but it did help people with technology advances. 1 X-Ray? WilhelmWilhelm accidently discovered the X-Ray. There was no problem, but it did help people with technology advances. 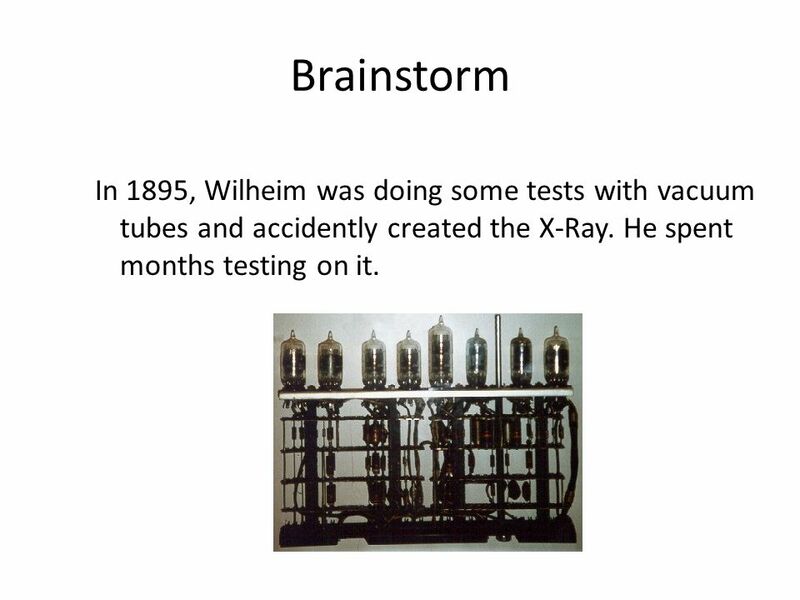 2 Brainstorm In 1895, Wilheim was doing some tests with vacuum tubes and accidently created the X-Ray. He spent months testing on it. 3 Design/Build In 1895, Wilhelm spent weeks in his lab. Trying to test his theory of the x ray. Later he found he was right and he took a piece of paper and made an X- Ray. 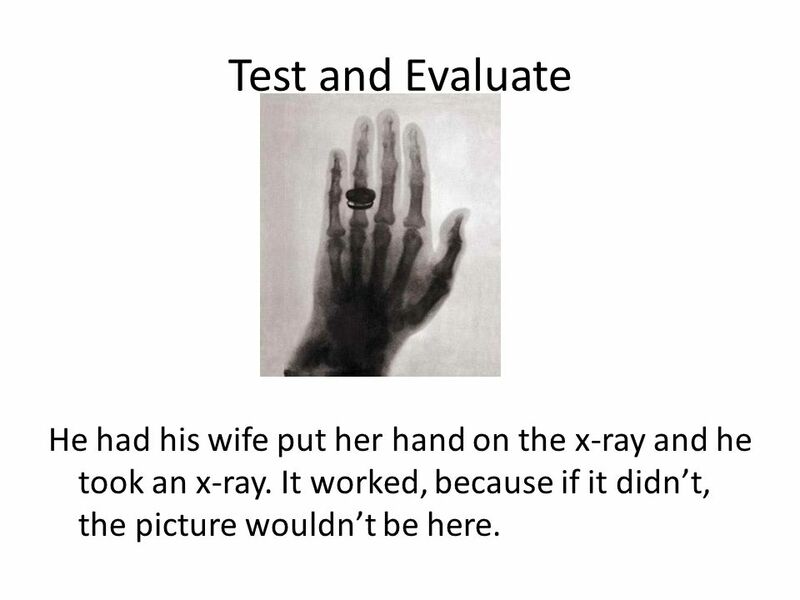 4 Test and Evaluate He had his wife put her hand on the x-ray and he took an x-ray. It worked, because if it didnt, the picture wouldnt be here. 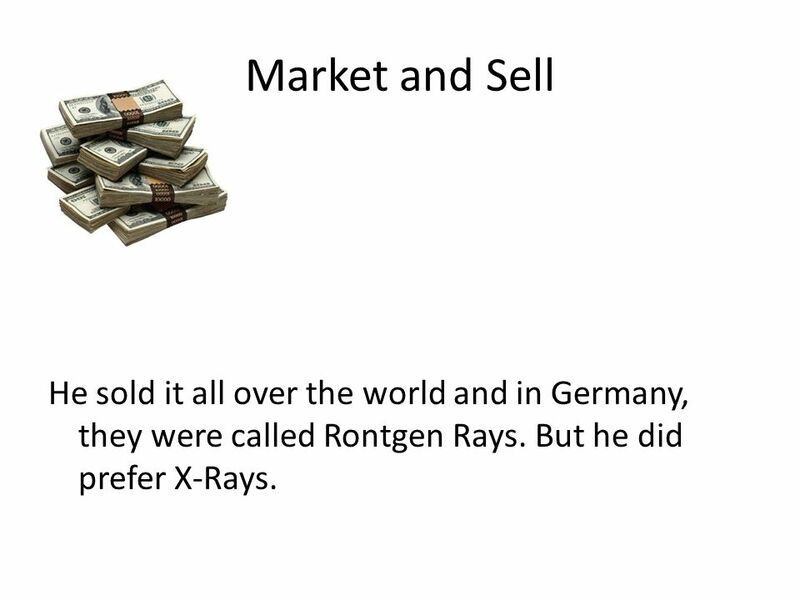 5 Market and Sell He sold it all over the world and in Germany, they were called Rontgen Rays. But he did prefer X-Rays. 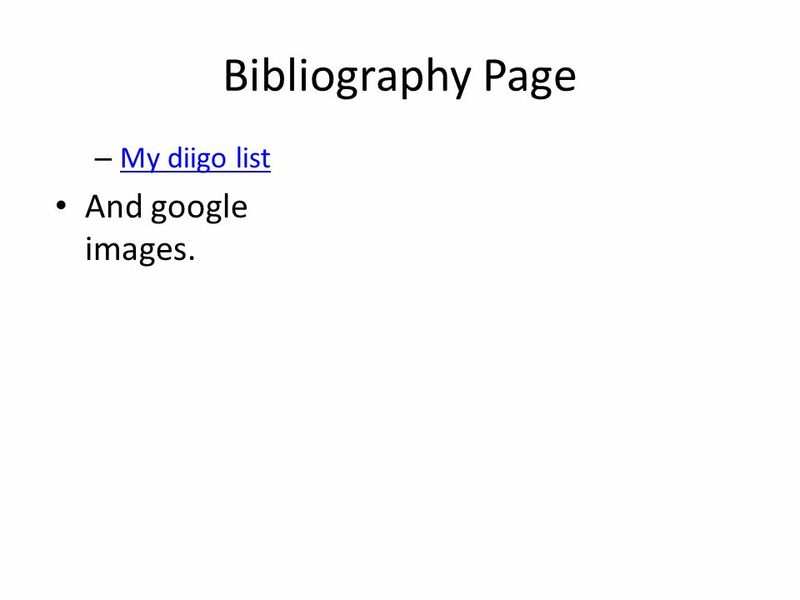 6 Bibliography Page – My diigo list My diigo list And google images. Download ppt "X-Ray? 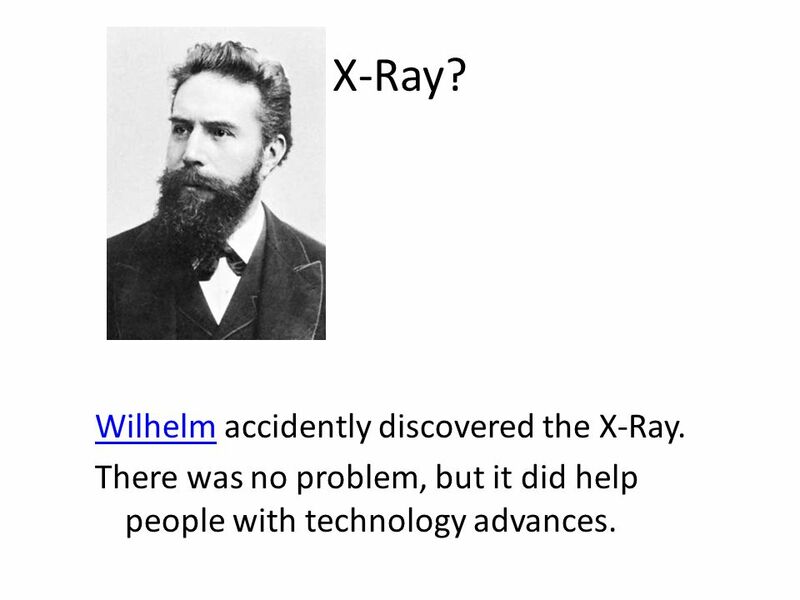 WilhelmWilhelm accidently discovered the X-Ray. There was no problem, but it did help people with technology advances." My Life as a Book Janet Tashjian By: Emily Wesley. / / X-RAY is part of the electromagnetic radiation. X-RAY has a form that similar to ordinary light rays (like infrared. X-ray Impact, Riccardo Giacconi. What uses X-rays? baggage scanners Airline scanners Homeland security scanners X-ray photographs of a broken bone— radiographs. Simple Present and Past Progressive by Sheryl Sherwin. AQA Science © Nelson Thornes Ltd C2 1.1 True or false? How to play: Put your hand up for true, leave your hand down for false. Keep track of your. The Microscope This presentation is a short introduction to the parts of a microscope. After learning the parts you will take a short quiz. This presentation. Created by Liat Rothfeld December 5, 2010 Begin Lily spent a whole class period creating an illustration in MS Paint. She went to File-Save, gave it. Watch video first- Science of Light &t=Light-Optics. My Inquiry about Vincent Van Gogh By Robert Saunders. Inventions, Tools, and Technology SOLVE PROBLEMS Third Grade GLE 0307.T/E.1 Describe how tools, technology, and inventions help to answer questions and. A My Name is Alice We will look at this book as writers, thinking about how the author put it together. What are some things that make this book fun to. Unit 1 – Improving Productivity Jake Carey. 1.1Why did you use a computer? What other systems / resources could you have used? I used a computer to finish. How to do a Powerful Presentation With Intention of Sharing the Business. Identify an Unknown Substance Presented by:. Introduction Physical Properties are Chemical properties are Picture of your substance.